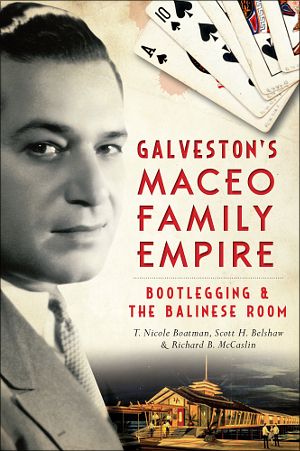 Saturday, March 14th, 2:00 – 4:00 p.m.
Nicole Boatman, Dr. Scott Belshaw, and Richard B. McCaslin return on Saturday with their history of Galveston’s Maceo family, now the best selling local book in Galveston. At the dawn of the twentieth century, Galveston was a beacon of opportunity on the Texas Gulf Coast. Dubbed the “Wall Street of the Southwest,” its laissez-faire reputation called those hungry for success to its shores. Led by brothers Salvatore and Rosario at the height of Prohibition, the Maceo family answered that call and changed the Oleander City forever. They built an island empire of gambling, smuggling and prostitution that lasted three decades. Housed in their nightclubs frequented by stars like Peggy Lee, Frank Sinatra and Duke Ellington, they endeared themselves to their Galveston neighbors by sharing their profits, imitating crime syndicates in their native Sicily. Though certainly no saints, the Maceos helped bring prosperity to a community weary from a century of turmoil.